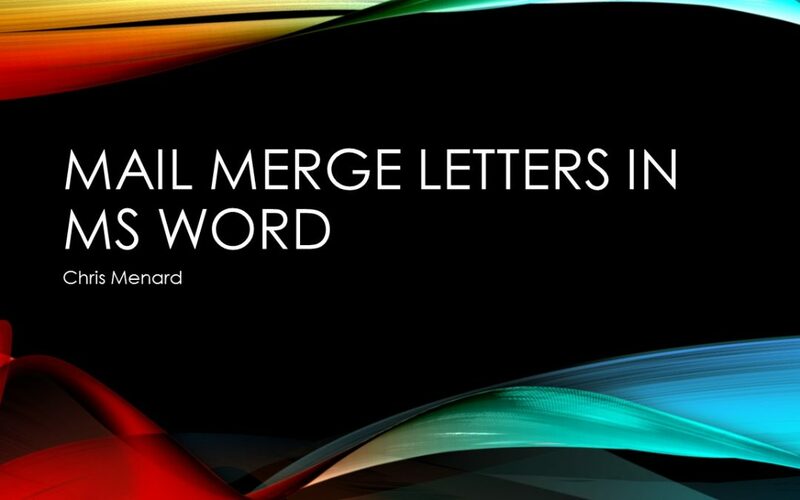 To perform a mail merge with Microsoft Word, you need a data source or a mailing list. The mailing list can be an Excel spreadsheet, a directory of Outlook contacts, an Access database, or an Office address list. It contains the records Word pulls information from to build the addresses for the labels, letters, or envelopes. One of the easiest data sources to use is Microsoft Excel. If you were sending your customers a letter, the Excel file would include Company Name, First Name, Last Name, Address, etc. Make sure the 1st row in Microsoft Excel is your header row when doing a mail merge in Word. Choose Select Recipients then Use an Existing List. Locate your saved Excel file. Pick Open and pick the correct worksheet. Type the date and any other information you want at the top of the letter. Press Enter several times, and insert an Address Block to show the recipient’s name. If the Address Block does not show the correct information (names, address, city, state, and zip) you can use Match Fields from the Insert Address Block dialog box or you can click Insert Merge Field and putting in the address fields. In your document, continue inserting any fields you want in the merge. Choose Finish & Merge > Edit Individual Documents, make sure All is selected and click OK.